Automation for the Factory of the Future! Imagine – a factory floor that can adapt to new tasks at any time, with minimal effort. Mobile and connected production equipment can be easily configured to fast-changing requirements, enabling serial and custom production of small batch sizes. Automation is the key to a digitized and highly flexible factory – the Factory of the Future. 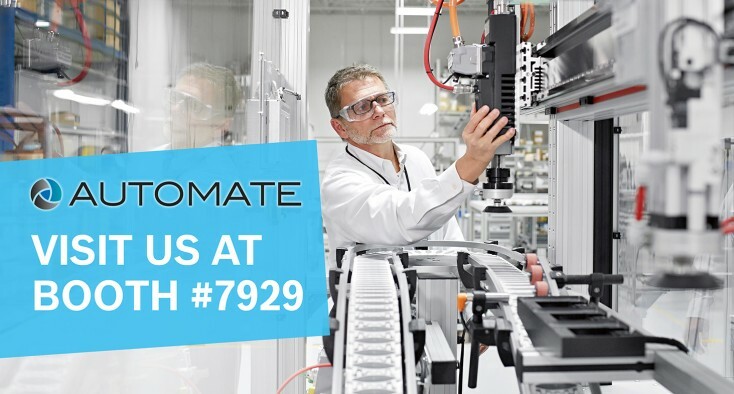 Join Bosch Rexroth at Automate 2019 in booth #7929 to learn about our intelligent automation technologies and services. Put the power of Industry 4.0/Industrial Internet of Things and connected automation to work for you today. Whether your customers require precise positioning with minimum cycle times, fast changeover for small-size batches, or flexible adaptation to changes in production, Bosch Rexroth’s I4.0-ready technologies increase your productivity, manufacturing flexibility, and scalability. Our proven portfolio of drives, motion controls, linear modules, conveyors and mechatronics technology, combined with our extensive industry application expertise, makes Bosch Rexroth your expert partner for driving advances in assembly and handling systems, motion control, machine safety, distributed drive systems, and connected automation. Our automation solutions allow for innovative machine designs, shorter machine build cycles, and reduced machine footprints. 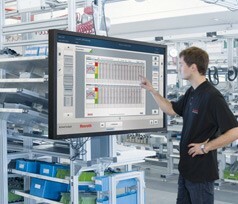 the ActiveCockpit system for production floor data visualization. We automate the Factory of the Future! Now. Next. Beyond. The Smart Assembly 4.0 Conveyor is a multi-technology display promoting technologies from across Rexroth’s product portfolio. Our uniquely-designed aluminum structural framing and TS2 plus palletized assembly conveyor represent assembly technology offerings. CKK Compact Modules’ three combined linear axes create a Cartesian robot for automated assembly using components from Rexroth’s linear motion products. The Indradrive Mi from our automation solutions gives the system a cabinet free design. The entire system is controlled by a Rexroth XM22 PLC with a Safety PLC with Safe Torque and Safe Motion and incorporates an open PLC platform that can communicate in many different ways. The Mechatronics@Work, Factory of the Future Showcase not only demonstrates the ability to customize a single batch size, viewers will also see cloud-based visualization and analytics of machine data. The Mechatronics@Work, Factory of the Future Showcase allows visitors to order a customized golf ball sleeve using a tablet to select the desired stack of three colored golf balls. Once the order is entered, the job is processed and tracked throughout the production flow and the status is displayed live. Expanding upon Rexroth’s Industry 4.0 Intelligence, the ActiveAssist is an assistance system which uses software to connect physical assembly to the virtual world. In combination with sensors, touchscreens, cameras and projectors, the comprehensive assistance system guides employees through the work steps with precision and reduces varied assembly tasks down to a batch size of 1. ActiveAssist is freely configurable software that supports employees with targeted information and help functions, which intelligently guide them through the assembly process. Intuitive to use and completely connected, the assistance system increases process reliability and quality. As an interactive communication platform, ActiveCockpit processes and visualizes production data in real time. ActiveCockpit’s software functionality can easily network with IT applications, such as, production planning, quality data management and e-mailing throughout plants, and provides information that is the basis for decisions and process improvements. Active Cockpit is an interactive web-based platform that is meant to sit right on the shop floor. By customizing it with all relevant data for a production line, associates can recognize deviations and make decisions more quickly to increase productivity. Network new and existing machines cost efficiently and optimize production processes and product quality: The IoT Gateway makes it easy to connect to Industry 4.0 environments without intervening in the automation logic. The precisely coordinated combination of control hardware and software for implementing IT applications collects sensor and process data, transmits it to MES, cloud applications or local machine state monitoring systems, for example, and enables process data analysis.